“When I’m entertaining during the holidays, my ideal cocktail captures the flavors of the season and adds a festive element to the dinner table. The drink needs to be delicious and imaginative but not too daring. People will be turned off if the ingredients stray too far from their comfort zone, and statements like, “I’ll just have wine” and “Oh, I never drink [insert random spirit name]” counter the culinary atmosphere I’m always trying to foster. This cocktail is as sophisticated as your guests, which each have unique, discerning palates. 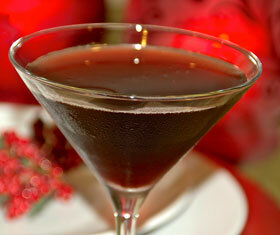 Learn how Jordan Catapano, a cocktail blogger, the drink’s creator, tailor-fits this holiday martini to each guest. Discover other holiday cocktails in our collection of original recipes from the top bartenders across the nation. For the organic vanilla simple syrup, boil one cup water, one cup organic sugar, and one organic vanilla bean for 10 minutes. Reduce to a simmer and cook 20 more minutes. Strain the syrup through a fine filter to catch vanilla bean particles and then set aside to cool. Combine all of the ingredients, stir and pour into a martini glass. Jordan Catapano, author of This Girl Walks Into a Bar: A Women’s Guide to Professional Bartending and Home Mixology, has had long experience as a professional bartender and mixologist. She blogs daily for ThisGirlWalksIntoABar.com and writes regularly for Modern Mom Magazine and Beverages & More. She has contributed her cocktail expertise to several online sites including The Huffington Post, Saveur Magazine, The Sacramento Bee, and The Bellingham Herald. Jordan hosts the webisode “Let’s Mix” and will soon be seen starring in the reality show “Setting the Bar.” She lives in Los Angeles with her husband and children.